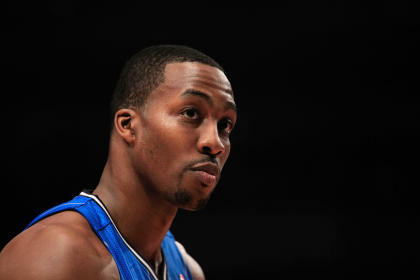 Orlando Magic star Dwight Howard told Yahoo! Sports he will not re-sign with a team outside his preferred list that trades for him, and emphatically denied that he ever used the term "blackmail" to describe how Magic officials convinced him to waive his early termination option. As the Los Angeles Lakers, Houston Rockets and other teams prepare possible trade offers for him, Howard told Yahoo! by phone that, "There’s only one team on my list and if I don’t get traded there, I'll play the season out and explore my free agency after that." Howard wouldn’t specify the team, but multiple league sources believe that it is the Brooklyn Nets. Howard also denied an ESPN report that he had told people Orlando Magic officials had “blackmailed” him into forgoing the early termination option on his contract that ultimately cost him his free agency this summer. "I never used the word blackmail in reference to any of my dealings with the Magic," Howard said. “I never said that. It’s defamatory and it’s inaccurate. I know what blackmail means and any report that I used the term incorrectly is inaccurate." Howard met with new Magic general manager Rob Hennigan on Friday in Los Angeles, and said he told Hennigan of his desire to be traded. However, Howard insisted he was merely repeating a position he had made clear to Magic officials since waiving his ETO in March. "This was not the first time [that I asked for trade]," Howard said. "I communicated this to [Magic president] Alex [Martins] and [former general manager] Otis [Smith] way before Friday that I wanted to be traded – months before this meeting with Rob Hennigan. That was all way before Stan [Van Gundy] got fired." Howard is rehabilitating from back surgery, and wouldn’t speculate on whether he could be prepared to return for the start of the regular season. Howard had a herniated disk repaired, and sizable fragments of bone removed on April 20. Before the diagnosis that Howard would require season-ending surgery late in the Magic's regular season, Howard had heard the suggestions inside and outside the organization that perhaps he wasn’t truly injured, that maybe he had bailed on his team. "I’ve never faked anything," Howard told Yahoo! Sports. "I’d never fake a back injury to not play for my team. I played a lot of games in a lot of pain, and there were times that I was crying in the locker room afterward because I was so seriously hurt. But I kept fighting. I’ve played with a cracked sternum in the past, and played with a lot of different [injuries]. "This time, I couldn't play. Regardless of what people say, 'Hey, you’re Superman,' I'm a man. I bleed. And I have bones, too. And something happened that I couldn’t control. "It really upset me that anyone would say that I was doing something out of spite for my team or my city. I have the utmost respect for the Magic organization, for the people of Orlando. Everything I did was from my heart, and I would never do anything to betray my city." Howard discussed something else that had become synonymous with his season, and that was the bizarre April 5 shootaround in Orlando when his former coach, Stan Van Gundy, told reporters that Orlando management had informed him that Howard had requested his firing. The video of Howard walking into a scrum of reporters, unaware of what Van Gundy had said, went viral. Ultimately, it became a flashpoint of criticism toward Howard. When asked if he felt set up, Howard told Yahoo! Sports: “I did. I had no clue about what had happened, about what he had said. I wanted to clear it up that this was not what was happening behind closed doors, and I stepped into something that I didn’t know how to handle. It hurts me to this day, thinking about how people were saying these things about me, calling me, "a coach killer," and all this crazy stuff. It upset me, it hurt a lot."